Part of it has to do, we assume, with the appeal of a somewhat romanticised idea of clandestine operations, with staying under the radar, with a tradition and practice of resistance that some of us like to see ourselves in. In recent years, the idea of anonymity has also led to some rather problematic situations, because it raised questions of accountability, of different kinds of regimes of visibility, of being associated with things we could not all believe in. But why, so far, we have always decided to stick with it, is the idea of socialisation, of sharing credit, credentials, social capital, through a very simple rule: whoever has participated in two secret agency projects can use this name for their future projects. Without anonymity, this would not work. And therefore, we do not share our names publicly. In a setting like this one, yes, occasionally, but for instance, not in a documentation of this event that would be made public. So we trust that nothing we say will leave this room. Or rather that room, where you are, and we are not. We have, however, in the past not been so secretive about where we are from. When asked where we are from, in recent years, we have usually said something along the lines of “Most of us are based in Hamburg”. But where you are from is, of course, a currency in the art market, too. You are, for instance, only eligible to most kinds of arts funding if you are from a certain place. But beyond funding, your investment in a place is constantly questioned if you are not working where you are supposedly from. For instance where you are now, in Oberhausen, where we are not from. And we have to note that in the Actopolis context, this constitutes an exception from the rule that curators are actually from or based in the city for which they curate. We can, of course, point to previous projects we have done here, there, where you are now, in Oberhausen, that somehow legitimise our having been there again, our working there, as curators for the city. And we wouldn’t be lying if we said that there have been years when we have spent more time together in Oberhausen than anywhere else in the world. But maybe we should extend the principle of anonymity to place, as well. Wouldn’t it be Utopian to say we are from no place? And to be able to work anywhere? Some people move on, some people stay behind, some people join the circus. And we don’t know if, as the old song goes, they’ll be back again next year. We like coming back, too, but we also think it sometimes makes sense to leave. 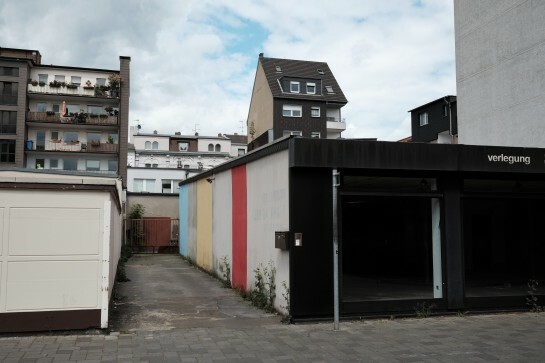 For the very first project we did in Oberhausen, we actually said – we don’t want to fix this place, we are not community nurses, if it is as bad here as they all say it is, then why not leave. We will give you a crash course in migration and buy some of you a one-way-ticket to another country. And what became clear in the preparation for Actopolis was that we increasingly tried to imagine the city itself as something less permanent, less set in stone. Something that could manifest at a certain moment as a constellation of infrastructures, people, and ideas, or, just as well, of music, booze and conversations, and that wouldn’t have to last. At first, when talking about building a new city, we thought about an antagonistic stance towards the old city, toward Oberhausen. We thought about destruction. But then, probably after visiting Bucharest and reading China Mieville’s The City and the City, we started to instead think of cities as something that you could maybe turn on and off, something that can suddenly happen, something you can opt in or out of, like a skype-conversation, something that can be new while co-existing with an existing city with which it shares the same space and some infrastructure, maybe a kind of parallel society but with maximum permeability, or maybe, more precisely, a specific figuration of the public. Now it is important to note that these ideas developed not as an explanation or rationale for what we were doing or what the people we had invited to do something were doing, but before, during, and after the event, informed in as much by what was not achieved or even attempted – a desideratum, something we should have done, made happen, should still do, in another new city, anywhere. When we said that for Actopolis, we wanted to proclaim a new city, which for us always means actually doing our best to make this claim real, to make it manifest in reality, albeit temporarily, we nevertheless made sure to point out that this claim was in turn based on Oberhausen’s specific history, on the fact that the city itself is relatively new, that it was built only to meet the needs of the coal and steel industry that had settled here, there, where you are now and we are not, and that after that industry had left, Oberhausen was again reimagined as a leisure and shopping paradise, when a huge shopping mall was built at a former industrial site, outside of the then old city centre, and tellingly called Neue Mitte, new centre. But what we also wanted to offer with the claim that we were all going to build a new city together was a way out of site-specificity. And we say that knowing that site-specificity, or some variation of it, be it situation-specificity or city-specificity, has always been an important aspect of what we have been doing. But we have increasingly seen a danger of perpetuating what is perceived as the problems of a specific place by making work that is specific to these problems. Or the danger that it becomes difficult to imagine a radically different future while trying to find ways out of the capitalist logic of scarcification and austerity on a local level. So we wanted to offer everyone the chance to ignore Oberhausen and its problems, at least in the first instance of developing an infrastructure for a new city, and think more generally and universally about what kind of city we want to live in. We have never talked about community as something we hoped to foster or create in our work – we always approached community as in danger of becoming a totality, as exclusive rather than inclusive, as something that some people are denied access to. Our understanding of publics, in contrast, is informed by Michael Warner’s conception of publics as collectives of strangers, as something that is constituted through an address that includes anyone in range, anyone who is listening, even if not everyone can fully identify with the address. Strangers are a constitutive element for Warner’s idea of publics, and we have always also read that as: people who are not from around here, or from around there, where you are, and we are not. And that does not have to mean artists and curators who are flown in, but it can. And maybe that means that, later on tonight, you can ask yourselves not only what kind of city you want to live in, but maybe the question can be: What kind of city do you want to be tonight? And how can people participate in this city who are not there with you, but somewhere else, for example here, where we are. I read the text about Actopolis.I wanted to inform that As the Mardin /Ankara curator I live and based in Mardin. Thanks, yes, that was unclear – it’s been changed.